Trinity College of Nursing & Health Sciences strives to provide a quality education that is accessible to all members of our nation's military community. 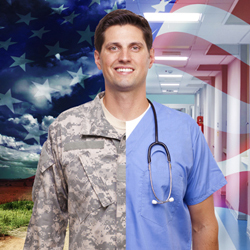 Our School Certifying Official is familiar with military and veteran education benefits and can assist you through the entire process of utilizing your education benefits at Trinity College of Nursing & Health Sciences. Advanced standing for Military Medics in the Bachelor of Science in Nursing Basic (BSN-B) program option is a selective process based upon an evaluation of previous academic and work experience. Accepted applicants enter in the fall semester. Qualifying military service member applicants may be awarded a total of nine (9) credits for their military training. Trinity College's BSN program prepares men and women from culturally and ethnically diverse communities for a career as professional nurses. Students who qualify for veteran's educational benefits should notify their Admission Representative and schedule a meeting with the School Certifying Official regarding eligibility as far in advance of the start of the semester as possible. For the purposes of certifying VA benefits, students are required to submit joint service transcripts in addition to all transcripts from previously attended institutions. Trinity College of Nursing & Health Sciences participates in the Post-9/11 GI Bill Yellow Ribbon Program. GI Bill® is a registered trademark of the U.S. Department of Veterans Affairs (VA). This program may be available to students utilizing Chapter 33 benefits. More information about the different education benefits offered by VA can be found by visiting the official U.S. government web site https://www.benefits.va.gov/gibill/ or by calling the VA Education Benefits hotline at 1-888-442-4551. The Tuition Assistance (TA) program may provide financial assistance for education programs in support of a soldier's professional and personal self-development goals. TA is available for courses that are offered in the classroom or by distance learning and is part of an approved academic degree or certificate program. For academic programs, associate, bachelor, or master, TA may not be used for a lower or lateral degree program from the one the soldier currently possesses. All eligible soldiers must request TA prior to the start of the semester. For further details on the provisions of TA contact your Education Liaison or Commanding Officer. Veterans may receive Vocational Rehabilitation and Employment (VR&E) services to help with job training, employment accommodations, resume development, and job seeking skills coaching. VA's Education and Career Counseling program is a great opportunity for veterans and service members to get personalized counseling and support to help guide their career paths, ensure the most effective use of their VA benefits, and achieve their goals. To learn more about the VR&E program, contact your VR&E counselor or visit http://www.benefits.va.gov/vocrehab/index.asp. The purpose of the policy is to describe the withdrawal and/or readmission process for Active Duty, Reservists, and/or National Guard Service members who are called to an extended military service assignment within a semester they are actively attending classes at Trinity College of Nursing & Health Sciences.